Background The link between housing and health is well established and long-standing, however much of the evidence relies on self-reported health measures. While these are useful, the availability of biomarker data allows us to add to this evidence using objective indicators of health. Methods In this paper, we use C-reactive protein (CRP), a biomarker associated with infection and stress, alongside information relating to housing details, demographic characteristics and health behaviours taken from the UK Household Longitudinal Study. Hierarchical linear regression models estimate CRP for individual housing characteristics, and all available housing characteristics, controlling for confounders. Results Results indicate that housing tenure, type, cost burden and desire to stay in current home are associated with CRP. Private renters have significantly higher (worse) CRP than owners with a mortgage. In terms of housing type, respondents living in detached homes had lower CRP than those in semidetached or terraced houses, or those living in flats. Housing cost burden is associated with lower CRP, although further analysis indicates that this is the case only for low-income renters. Desire to stay in current home is significantly associated with higher CRP. Conclusions A number of housing characteristics were associated with CRP. These results further support an important role for housing in health. Concern about the health impacts of housing has a long tradition. Rowntree wrote about the ‘inadequate and insanitary’ housing of the ‘struggling poor’ and the impact of these problems on health in 1901.1 In 1934, Britten wrote about the high mortality rates in slum areas of the USA and UK.2 His concerns (poor sanitation, overcrowding, poor ventilation and light, disrepair and fire risk) remain relevant to this day. Recent high-profile cases of sanitation problems—such as the contamination of water in Flint, Michigan3 and the presence of raw sewage in and around homes in Alabama4—and poor fire safety, for example, at Grenfell Tower in London,5 have highlighted the importance of continued vigilance to housing issues. Housing appears to influence health in numerous ways. Recent research has moved beyond the physical characteristics emphasised by Britten, to increasingly recognise the influence of social and psychological housing factors. Shaw6 categorised influences of housing on health into ‘hard’ and ‘soft’ types. Hard influences include the physical characteristics of housing that might directly impact health, such as material housing conditions. Soft factors include the meaning of home, and the role a person’s home plays in perceptions of security and social position, including issues around affordability. This categorisation may be thought of as highlighting the dual role of housing as shelter and as home. However, tenure differences are context dependent. 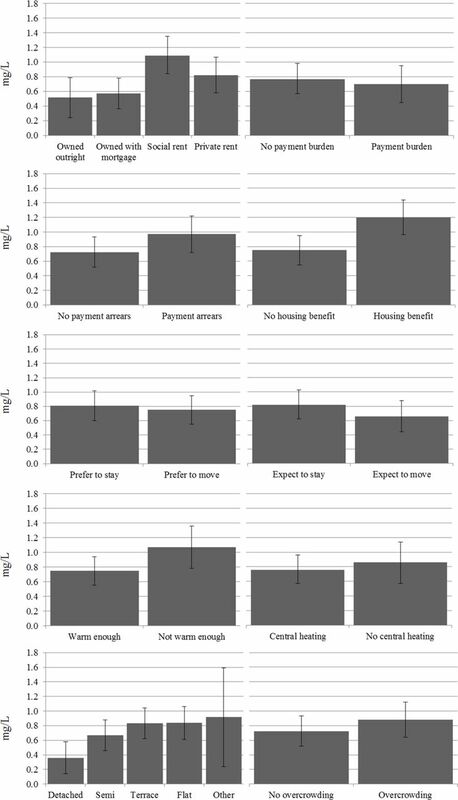 Work using Australian panel data has found worse health outcomes for renters facing housing payment problems compared with owners,18 as did a cross-European study.19 Differences in tenure effects may reflect the psychosocial effects of inequalities, where tenure hierarchy and status may vary considerably depending on the context.20 Relatedly, they may reflect differences in housing policies. For example, while private renters in the UK have short tenancies and little security compared with owners, in Germany tenancies are indefinite and regulation is more robust.21 Thus, health effects may differ. Although extensive evidence links housing with health outcomes, one criticism of existing evidence is that it often relies on self-reported health measures.6 While self-reported health is an important health measure, strongly associated with mortality,23 there have been calls to complement existing evidence with use of biomarker data.24 Biomarkers are ‘objective indications of medical state’ that can be measured ‘accurately and reproducibly’.25 In this paper we use a biomarker associated with stress and inflammation and report associations with a range of housing measures. This paper focuses on the biomarker C-reactive protein (CRP), a marker of inflammation associated with infection or stress. CRP levels above 3 mg/L are associated with cardiovascular disease.27 CRP is related to unemployment28 and low socioeconomic position (SEP),29 suggesting CRP is an appropriate biomarker for the study of housing. The association of CRP with both infection and chronic inflammatory processes means CRP elevations could reflect both direct influences of housing on health (eg, low temperature leading to infection) and indirect effects (such as physiological effects of stress associated with unaffordable housing). However, by excluding participants with high CRP (outlined below), we focus principally on indirect pathways relating to chronic processes. Analysis is limited to cases with valid CRP information (n=11 781 weighted, 12 902 unweighted). Cases with CRP>10 mg/L are removed (n=641 weighted, 716 unweighted) as this is considered an indicator of recent infection.27 Those with CRP below the detectable limit of 0.2 mg/L are given a value of 0.1 mg/L. CRP was positively skewed and so log transformed for the regression analysis (see online supplementary appendix figure 1). Analysis is restricted to participants aged over 21 as younger respondents may still be in education (an important predictor of SEP) and living with parents rather than independently. Similarly, a very small number of people aged over 95 are removed. Cases with missing predictor variables are excluded. The final sample size is 9593 (weighted, 9974 unweighted). In order to study the association between housing and health we select indicators of housing situation (table 1), guided by existing evidence from the literature. There are differences in housing experiences across ethnicities,32 partly due to persistence of discrimination in the housing sector.33 34 We therefore include ethnicity, although in broad categories due to small cell sizes for some groups. Cohabitation status is included as it will likely affect the resources available for obtaining housing, as well as the space required. We include Government Office Region because of variation in housing policy between UK countries, and markedly different housing markets across the UK. We include employment status, by which CRP has been found to differ.28 Relatedly, social renters are more likely to be economically inactive or have a low household income than people in other tenures.31 Meanwhile, SEP more broadly is associated with both tenure and health, raising the possibility of confounding.31 35 36 We therefore also include highest educational qualification and an indicator of income. (We include income quartile equivalised by age, where income reflects gross household income in the month before survey response, equivalised using the modified Organisation for Economic Co-operation and Development equivalence scale, adjusted for inflation. Inflation data from https://data.oecd.org/price/inflation-cpi.htm.) Alongside income, we include a variable reflecting subjective financial situation, to capture financial strain. Smoking status and body mass index (BMI) are included because of the established relationships between smoking, adiposity and increased inflammation,37 38 as well as the uneven distribution of these characteristics across tenures, likely reflecting otherwise unmeasured social characteristics as well as selection into tenure. Smoking variables are only available at wave 2, so these values are also used for people who had biomarker collection at wave 3. BMI (kg/m2) is calculated from height and weight measured by a trained nurse using a Frankfort plane and digital floor scales, and categorised using standard WHO classifications (http://www.euro.who.int/en/health-topics/disease-prevention/nutrition/a-healthy-lifestyle/body-mass-index-bmi). Since raised inflammation may reflect pre-existing chronic illness, a binary self-report indicator of long-standing illness is included. We first explore mean levels of CRP for people in different housing situations, controlling for age and gender. Following this, we run a series of linear regressions in Stata, accounting for survey design. Initial models explore associations of individual housing characteristics with CRP (model 1). Controls are then added for demographic characteristics and SEP (model 2), and following this for health and health behaviours (model 3). The final model includes all selected housing characteristics, as well as controls for demographic characteristics, SEP, health and health behaviours (model 4). All models apply inverse-probability weights to address differential sampling and response probabilities. Within our sample mean CRP is 2.01 (untransformed), with an SD of 1.98, minimum 0.1 and maximum of 9.9. 22.08% of participants have ‘raised’ (above 3 mg/L but below 10 mg/L) CRP (weighted). We first report associations between the housing variables and inflammatory markers, controlling for age and gender (figure 1). Few statistically significant differences are found. For tenure, social renters have the highest CRP. Given the nature of selection into this tenure this should not be surprising, however CIs overlap with those for private renters. For the financial variables, those receiving housing benefit have higher CRP than those not receiving housing benefit. For building type, CRP is considerably lower for those living in detached homes than other categories. The CIs overlap with those for semidetached homes but not for terraces or flats. Mean C-reactive protein (CRP) controlling for age and gender. Results of regression analyses (table 3) indicate that, with all other housing variables controlled for, private renters have significantly higher CRP than those who own their home with a mortgage. Accounting for all other housing variables, housing type is still predictive of CRP, with higher CRP for those living in semidetached and terraced houses, or those living in flats, compared with those in detached houses. Those who want to stay in their own home have slightly higher CRP levels. Unexpectedly, experiencing housing payment burden (spending more than one-third of household income on housing costs, while income is below 60% of the median) is associated with lower CRP. We investigate whether this may be due to a protective effect for higher housing spending for low-income renters. Mean CRP levels are higher for renters (both social and private) who are not experiencing housing burden compared with renters experiencing burden, while the reverse is true for owners with a mortgage. (Outright owners have no housing costs and so none experience housing cost burden. Social renters however may experience housing cost burden as social housing rents in the UK are not limited according to household income.) A regression model interacting tenure with housing cost burden (table 4) confirms this difference, finding higher CRP levels for private renters, but lower levels of CRP among renters experiencing housing cost burden. To check robustness of findings, we run a number of additional analyses. Models are run excluding participants taking statins (n=1503) or anti-inflammatory (n=538) medication, which influence CRP levels. This does not substantively affect results (online supplementary appendix table 1). To check timing of collection or processing of biomarkers does not affect the results, we run a model including the wave at which biomarker information was collected (83.67% responded at wave 2; 16.33% at wave 3, weighted). A second includes the month of data collection, given plausible seasonal variation in illness and stress. Neither addition substantively affects results (online supplementary appendix table 1). A model accounting for noise from neighbours is presented to check if the significant finding for housing type is due to lower noise levels in detached homes. As noise was only included in wave 3 of the survey, we use the noise response from wave 3 for all participants, and rerun models including noise and interactions between noise and housing type. Even with these adjustments, housing type significantly predicts CRP (online supplementary appendix table 2). We include indicators of BMI and smoking status in our analysis. Given that a degree of mediation between these indicators and housing characteristics is plausible, estimates are likely to be conservative. We report a version of our final model (model 4, table 3) without these controls in the appendix (online supplementary appendix table 3). Results are broadly similar, with the exception being that in the model excluding BMI and smoking living in social housing is associated with higher CRP levels. This likely reflects compositional differences, 32% of the social rent respondents reported having never smoked, compared with over 57% of owners (both outright and with a mortgage), for example. This analysis investigates the association between people’s housing experiences and their health, measured using CRP. Results indicate that living in the private rented sector, a home other than one that is detached, or wanting to stay in the current home is associated with higher CRP. For a number of variables where a relationship with health was expected—the home being warm enough, expecting to move, anticipating a forced move—no statistically significant association with CRP is found. The lack of a significant finding for expecting to move may be due to the positive and negative reasons for moves cancelling each other out in the analysis. The number of people anticipating forced moves was small, affecting less than 3% of the sample. Thus, although the point estimate for CRP is consistent with a greater elevation for this group than for the elevation associated with living in a flat, the lack of statistical significance is perhaps not surprising. While for the thermal comfort variable, research has found a complex relationship between temperature and health (eg, Sutton-Klein et al 40), the lack of a statistically significant finding likely reflecting this complexity. Unexpectedly, facing housing payment burden is associated with lower CRP levels. We hypothesise that this could be because higher expenditure on housing enables people in lower income households to access better quality rented housing, the health benefits of this outweighing the damaging effects of financial strain. Further research, using surveys which collect information on factors such as damp and mould, will be required to test this hypothesis. A limitation of this analysis is that the UKHLS does not contain information on housing conditions such as damp or mould, particularly relevant to the hypothesis that high housing cost burden among renters may positively influence CRP through reduced exposure to poor housing conditions. The approximately 5-month gap between the main interview and biomarker collection means that housing situations at biomarker collection may differ from those recorded, potentially affecting results. Biomarker data were not collected for children, so our analysis considers only adult health. The use of household survey data means that we do not consider homelessness, despite obvious health links. Perhaps most importantly, the data used here are cross-sectional, as biomarkers have only been collected once in UKHLS. This precludes longitudinal investigation of causal relationships between housing and CRP, and instead we report associations. This paper identifies a number of ways in which housing situations are associated with adult CRP levels. Higher CRP, indicating worse health, is found among those living in the private rented sector. This finding supports arguments for greater consideration of the negative effects of the current private rented market in the UK, characterised by greater insecurity, higher cost and lower quality than is typically found in other tenures. However, due to the cross-sectional nature of the data, this paper cannot make causal claims. Further work will be required to investigate whether specific aspects of the private rented sector, such as housing quality, are responsible for the link between private renting and CRP. Results also find lower CRP levels among those living in detached houses, even after accounting for different aspects of SEP. This points to a possible role of autonomy, which may be greater for people living in detached houses than in other types of buildings. Overall, results of this analysis using biomarker data complement existing work using self-report measures, providing further evidence of an important association between housing and health. A range of research, both qualitative and quantitative, has found associations between housing experiences and health outcomes. Much of this evidence has used self-reported measures of health. This paper uses C-reactive protein to build on this research by exploring the association between housing experiences and an objective measure of health. The analysis finds that C-reactive protein is associated with tenure, building type, housing cost burden and desire to stay in current home. These results support arguments that health outcomes should be a consideration of housing policies. The authors thank the UK Data Archive and Institute for Social and Economic Research for collecting and supplying the data, and the survey respondents for their time. The authors also thank the attendees of the ‘Residential Contexts of Health’ Working Group at the 2018 European Network of Housing Research conference for their helpful comments.
. Poverty: a study of town life. London: Macmillan, 1971.
. Reductions in housing benefit increases depression risk in low-income UK households. Am J Epidemiol 2016;184:421–9.
. The consequences of modernity. Cambridge: Polity Press, 1990.
. A nation of homeowners. London: Unwin Hyman, 1990.
. Ontological security and psycho-social benefits from the home: qualitative evidence on issues of tenure. Housing Theory Soc 2001;18:50–66.
. Unhealthy societies: the afflictions of inequality. London: Routledge, 1996. University of Essex. Institute for Social and Economic Research and National Centre for Social Research. Understanding Society: Waves 2 and 3 Nurse Health Assessment, 2010- 2012 [computer file]. Colchester, Essex: UK Data Service [distributor]. April 2013. SN:7251.
. Understanding Society: UK Household longitudinal study: biomarker user guide and glossary. University of Essex: Colchester, 2014. Scottish Government. Scottish household survey annual report 2016. Edinburgh: Scottish Government, 2017. MHCLG. English housing survey: headline report, 2016-17. London: MHCLG, 2018.
. Which ethnic groups are hardest hit by the “housing crisis”? Ethnic identity and inequalities in Britain. Bristol: Policy Press, 2015.
. Theorising Ethnic and “Racial” Exclusion in Housing. “Race”, housing & social exclusion. London: Jessica Kingsley, 2002.
. Health inequality: an introduction to concepts, theories and methods. Cambridge: Polity Press, 2017.
. Association between indoor temperature and general health in english adults: a cross-sectional study. J Epidemiol Community Heal 2017;71(Suppl 1):A64. Contributors AC and AH were both involved in the development of the research idea, the analysis and the write-up of the paper. Funding AC was supported by Economic and Social Research Council (ESRC) grant number ES/L009153/1. AH’s time on this manuscript was supported by ESRC grant ES/M008592/1 while at the University of Essex. The biomarker data from the UKHLS were collected by NatCen on behalf of the Institute for Social and Economic Research and funded by the Economic and Social Research Council. They are made available through the UKDS (SN 7251). Data sharing statement All of the data used in this paper are available to researchers via the UK Data Archive.